Maybelline New York is the “number one make up brand worldwide”, available in over 129 countries. The Maybelline New York brand was invented in 1914 and is still going strong almost 100 years later, the brand will be 100 years old next year. Surely you know that famous tag line ‘Maybe she’s born with it, Maybe it’s Maybelline.’? 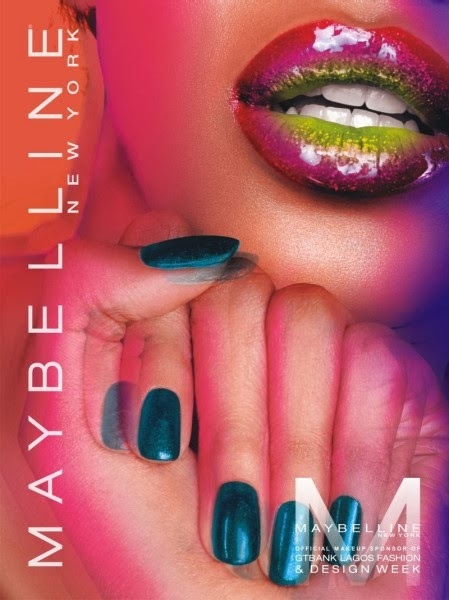 Well this October, Maybelline New York formally launches in Nigeria, bringing the ultimate make up innovations to the very fashionable women of Nigeria. As part of the many activities taking place to introduce the brand to the market, Maybelline New York had a cocktail event to formally launch the brand on Friday 18th October 2013 with fashion and beauty industry insiders and celebrities in attendance. On top of that, the brand is the official make-up sponsor of the Guaranty Trust Bank Lagos Fashion & Design Week 2013 taking place from Wednesday 23rd – Saturday 26th October 2013. Maybelline is a beauty brand with fashion in its DNA and for the brand, it is a mission to take the latest fashion looks from catwalk to sidewalk, making them accessible to the everyday fashionista. Currently Maybelline sponsors 14 Fashion Weeks across the world including the prestigious Mercedes Benz Fashion Week in New York. This year, it will be adding the Guaranty Trust Bank Lagos Fashion & Design Week as its 15th. Maybelline will partner with the legendary MUA Bimpe Onakoya as make up artistic director for the Fashion Week and together bring the most artistic, up-to-the minute looks to the runway shows.